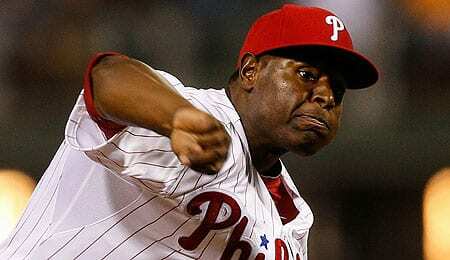 The Philadelphia Phillies blew a 3-0 lead on Sunday, losing 5-4 to miss a chance to sweep the Marlins. Philadelphia had been struggling a bit before this series, but seemed to be getting back on track before this defeat. The loss drops Philly 7.5 games behind the third-place Marlins in the NL East, thereby dooming any slim hopes it had of passing Miami. Few experts predicted the Phillies would avoid 100 losses this year, but even if they lose their remaining 12 games, they would wind up with just 95 setbacks — still a four-game improvement from last year. Clearly, the rebuilding process is well underway, and 2016 has seen more progress than expected. Some credit has to go to Manager Pete Mackanin for keeping this team very competitive. Let’s review some of the more interesting Fantasy related stories emerging from the City of Brotherly Love. While reliever Hector Neris played the goat on Sunday, it’s hard to overlook what a great contribution he’s made this season. He’s been seeing a bit more high leverage work down the stretch as the Phillies are rumoured to be interested in shopping some relievers this winter. While Neris has had a rough September, he was untouchable in August and pretty damn good in July, too. He’s turned into a serious workhorse reliever (second in the NL in appearances) and given his massively improved strikeout rate and holds, he’s a very Fantasy worthy one as well. Toss in a sweet ERA, and you’ve got yourself a breakout season on your hands for Neris. It’s an under the radar story, but his emergence has been one of the best developments for this team — especially given that he’s shown the ability to shut down top hitters with his nasty splitter (see video below). Another positive development is second baseman Cesar Hernandez’s emergence as a legitimate everyday player. With a single and two walks Sunday, he’s now hit safely in six straight and eight of his last nine games. Hernandez has already set a career high in runs and his .290 BA is quite useful as an NL-only option. With J.P. Crawford on the way and Freddy Galvis also deserving to keep his job, Hernandez’s status for 2017 is up in the air, but he’s proved he can be a useful player. Rookie first baseman Tommy Joseph more or less took the job away from long-time Phillie mainstay Ryan Howard. Former catcher Joseph’s defensive transition to first base has left something to be desired (-1.1 dWAR), but after a string of concussions threatened to end his career before it really got going, his emergence has a feel-good quality to it. Joseph had two hits, an RBI and a walk Sunday to extend his hitting streak to five games as he’s now batting .444 over the last week. It’s nice to see considering how badly he slumped in August. Joseph’s slugging this month has been a nice bonus, and his homer Saturday — his third in seven games — gave him 20 for the season. (As an aside, for the first time in team history, the Phils have four infielders with 20 or more homers this season.) He’s a decent young hitter with some pop, which makes him an option in deep NL-only leagues. Obviously, Joseph would have been a much more attractive Fantasy option as a catcher, but there’s some upside here. On the flipside, third baseman Maikel Franco started the season like a house on fire, but has really scuffled in the second half. His glovework has improved this season, but his bat has regressed. Franco was 0-for-4 with a strikeout Sunday, dipping his average to .231 over the last week. It’s now been over a month since he last went yard, and after stroking 18 bombs in the first half, he has just four since the break. Franco was enjoying a decent September, notwithstanding the power outage (at least he has five doubles), but his slugging numbers have really dipped. He’s still maturing as a young power hitter, so we’ll cut him some slack, but he does occasionally swing at some real bad pitches. We like the fact Franco hit fewer groundballs this year, but it didn’t result in the homer total we expected as his HR/FB rate dipped. Still, let’s put things in perspective: this was his first full season in the bigs. The best is yet to come for Franco. Sophomore outfielder Odubel Herrera has shown modest improvements this season. He homered and singled Sunday, running his hitting streak to six games — five of them multi-hit efforts. Herrera now has six runs over the last four games, and has driven in a run in each of the last three while batting .500 over the last week. The downside is that he’s struggled against lefties and that’s caused him to sit periodically. But after a strong first two months and then mediocre play during June, July and August, Herrera is finishing strong, perhaps in an effort to hold off top prospect Roman Quinn. Some of Herrera’s doubles have become triples or homers this season, leading to more productivity. And while his BA isn’t as good as it was during his rookie effort, the overall gains in power and speed have more than made up for it. Herrera’s turned into a real Rule 5 gem for the Phillies. Now it’s your turn. Let us know in the comments below what you think has been the best Fantasy story for the Phillies this season. This entry was posted on Monday, September 19th, 2016 at 2:39 pm	and is filed under BASEBALL, RotoRob, Team report. You can follow any responses to this entry through the RSS 2.0 feed. Both comments and pings are currently closed.